The Kabbalah is often considered the most important and far-reaching phase of Jewish mysticism. The unique map of consciousness central to Kabbalah is the so-called Tree of Life, which aims to integrate all aspects of ourselves: mind, body, and spirit. For centuries it has been considered too sacred for the general public. Now it is becoming widely known and widely studied. Here, in one volume, is an introduction to its perennial wisdom. Chapters include: What Is the Kabbalah? ; The Tree of Life; The Mystical Kabbalah; Living with the Kabbalah; Resources; more. All color deluxe book that is informative and profusely illustrated with old Kabbalah and alchemical prints, etc. 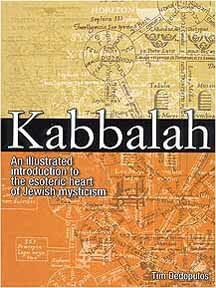 KABBALAH: An Illustrated Introduction to the Esoteric Hearth of Jewish Mysticism By Tim Dedopulos. 128 Pages. 7x10 Hardback. Illustrated. References. Index.